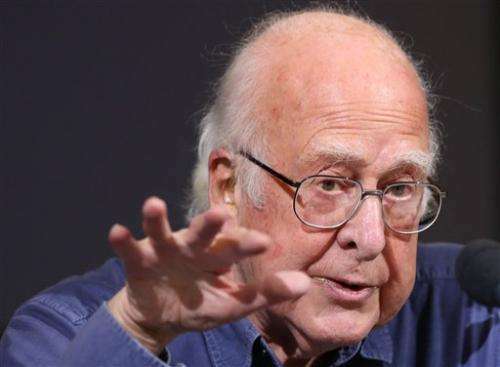 Nobel Prize-winning scientist Peter Higgs says he is hoping to fully retire next year at the age of 85—and that he once turned down a knighthood. Higgs also revealed that he turned down the offer of a knighthood from then-Prime Minister Tony Blair in 1999 because he thought "anything of that sort was premature" and because he didn't want "any sort of title." After he retires he will die someplace and then he will get recycled by the elements and than he will truly be everywhere just like the field he marketed. He http://www.scotsm...-2709488 apparently. I do agree with Peter Higgs that people like Richard Dawkins are fundamentalists in a similar sense as the believers themselves. I with ya on that one Zeph,,, Dawkins' kind of crusading is a big turn off for me too. I'm an atheist first, middle and last,,, but Dawkins goes beyound the pale in many of his presentations. I think he sees himself as the T. Huxley or the S. J. Gould of his time, both of them were miles better at presenting their case.